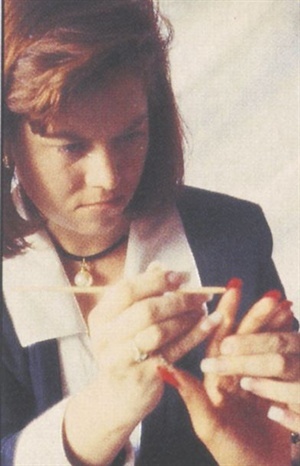 Rouillard’s most recent competition win was fourth place for sculptured nails at the NAILS National Tour Grand Masters Championship in Las Vegas in November 1993. She won first place at the 1993 WINBA show in Anaheim, Calif., and second place at the 1993 Long Beach Hairdressers show, also for sculptured nails. Rouillard attends approximately five shows per year. “I pay all my expenses when I go to shows, and it pays off immediately when I get lucky and get a first. But it pays off later in more clients and better work,” she explains. For this month’s cover, Rouillard sculpted pink and white acrylics with forms using a fast-setting powder. “Nails for competition and nails to be photographed are different from shop nails. In competition, you want to sculpt nails that are beautiful-looking and technically correct. In the shop, I sculpt nails that will last and that will stand up to things like typing because my clients are professional working women,” she says. Rouillard has learned a few tricks for sculpting nails during her 10 years as a nail technician and nail competitor, such as squeezing the acrylic nails as they dry to curve and narrow them. “I squeeze just where the pink and white meet, at the stress area. This also helps drop the curve into the sidewalk When the product heats a little and feels like it isn’t soft anymore, I know it’s dry and I can stop squeezing,” says Rouillard. Rouillard worked at a few salons as an employee before her current position as an independent contractor at Let’s Design Hair in Phoenix, Ariz. She’d like to open her own salon when, she say’s, “I have the time it takes to run a business. Being an independent contractor suits her other job: mother to a two-and-a-hall-year-old girl. “I can schedule my work days so I’m home most weekdays,” she says. Current Position: Nail technician, Let’s Design Hair, Phoenix, Ariz. Experience: 10 years doing nails and competing. Specialty: Acrylic nails using pink and white powders.